Use the form below to inquire about Heritage Villa at Maraarikulam . Use the form below to reserve for Heritage Villa at Maraarikulam . Has 2 rooms with a large living room between them. It also has a sit out in front. Rejuvenate at this Heritage Villa at Maraarikulam, a stunning example of Kerala architecture, amidst verdant tranquillity. Placid backwaters and sprawling paddy fields greet you in picturesque Maraari village, situated about 15 km from Alleppey. The famous Vembanad Lake and its backwaters are a stone’s throw away from this Heritage Villa at Maraarikulam. With old temples, churches, sparkling beaches, and bird sanctuaries close by, this is one destination that offers you plenty of experiences. Ensconced in a calm natural setting amidst high trees and lush lawns, this Heritage Villa at Maraarikulam echoes the charm of a bygone era. 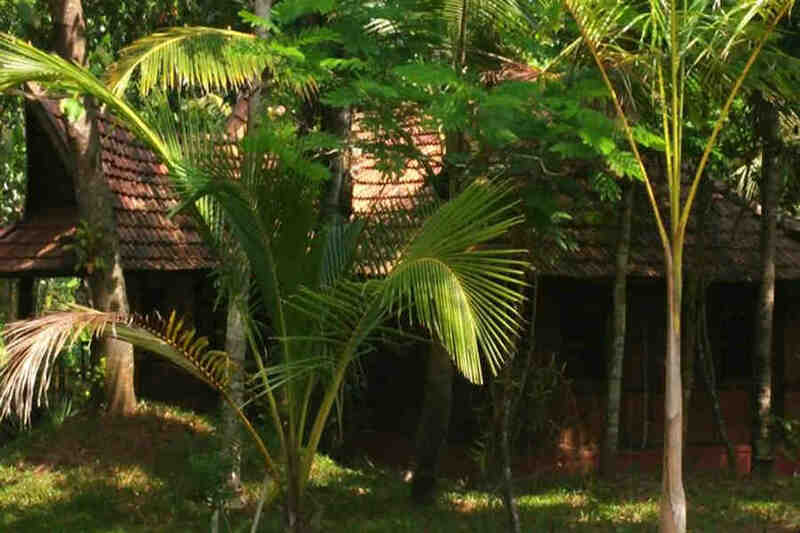 With traditional wooden wall paneling and typical Kerala exteriors, the traditional Kerala houses on the property sprawl over 3.5 acres and merge seamlessly with nature. The doors of the kitchen here stay open all day for you to enjoy beverages, snacks, and meals. Quite a few local sea food delicacies feature on the menu that includes a wide selection of vegetarian and non-vegetarian dishes. The library on the property has a stash of interesting books for you to delve into as well as a few board games if you are inclined to spend some time on these. There are five rooms divided among three traditional wood houses, all furnished elegantly. Known as ‘Illams’, the structures are named after trees – Eatti, Chandanam, and Maavu. Eatti has two bedrooms, a large living room that can double up as a bedroom, and a sit-out making it ideal for large groups and big families. Chandanam has two interconnecting rooms which also come with their own separate entrances from the large veranda that hugs the house. A large family room and veranda make up Maavu which is furnished with one king size bed and a smaller double bed to easily accommodate up to four people. This Heritage Villa at Maraarikulam is the best way to experience the laidback lifestyle of rural Kerala firsthand. The villa is pet-friendly and welcomes pets at a flat charge of INR 250 per day. Pets are allowed provided that they stay off the furniture and linen and the owner ensures their safety and the safety of other guests at the homestay. Walk beside the Vembanad backwaters to Muhamma Boat Jetty where floating boats and flocks of birds create a scenic picture to bring about calming tranquillity. From the jetty catch a ride to Kumarakom Bird Sanctuary or Pathiramanal Island for some bird watching fun, or book a house boat for an enjoyable cruise along the world renowned Alleppey backwaters. These houseboats are luxurious with wooden panelled interiors. The mouth-watering food served on the boats together with warm hospitality is a memory to cherish forever. The famous Marari Beach is within walking distance and a great place to watch the sun come down every evening. The lovely 16th century St. Andrew’s Forane Basilica, Arthunkal, is around 7 km away, and perfect for a taste of history. The ancient Mahadeva temple situated within easy reach is unique for here, the deities Sree Mahadeva and Parvathi Devi sit facing each other. Alleppey town is also worthy of exploration with its beach, palaces, churches, and temples. If you happen to be visiting in August, be sure to check out the famous annual snake boat races of Alleppey. Cochin International Airport is the nearest at 72.4 km while Trivandrum International Airport is 163 km away. Kempegowda International Airport, Bangalore, is around 615 km away. Mararikulam railway station is the closest while Cherthala railway station is 10 km away. Alleppey railway station is 15 km away while Ernakulam (Kochi) railway station is at a distance of 50 km and Bangalore railway station is 600 km away. Alleppey is 15 km away and Kochi around 43 km away, connected by NH66. State capital Thiruvananthapuram is 173 km away while Bangalore is 583 km away.